Restorative Yoga allows you to come into balance with body’s natural rhythms by activating the parasympathetic nervous system, thereby turning down the fight or flight response. It slows the heart rate and releases tension from the muscles. In Restorative Yoga, the postures are fully supported by props such as blankets, blocks, and bolsters, so there is no holding, stretching, or strengthening involved. This is a practice of being, rather than doing, which allows tension to release at a deep level. Once the relaxation response is activated, the body and mind settles in, and the effects can be felt for days after. Come to a state of complete relaxation and allow your body and mind the space to heal. In 2016, Kristin completed the 200-Hour Bhakti Yoga Teacher Training through Yoga Mandali in Saratoga Springs, NY, led by Gopi Kinnicutt and Keli Lalita. 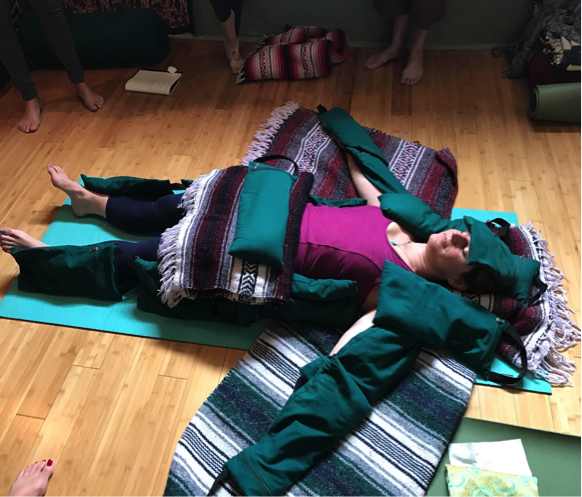 Kristin received her Level I and II Restorative Yoga Teacher Certification after completing both levels of yoga therapeutics training with Ann Saffi Biasetti, E-RYT-500. In August of 2017, she became a certified ChildLight Yoga® and Mindfulness for Children Instructor. Kristin provides a nurturing presence, creating a safe environment for clients. Using breath as the root of self-compassion, Kristin empowers students to move from a place of love and integrity. 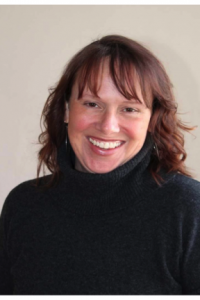 Kristin specializes in working with teens to help reduce anxiety and depression through mindfulness and connection to the body. Through the introduction of mindfulness techniques and the practice of restorative yoga therapeutics, Kristin encourages teens to discern their own natural and innate ability to calm and heal themselves. Kristin also works with people in transitional times of their life, helping them find a sense of grounding through breath, self-compassion, and spaciousness in the body and mind. Sue was introduced to restorative yoga in Ann Biasetti’s active yoga classes. 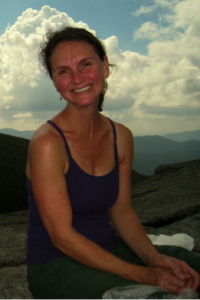 Wanting to explore the importance of restorative yoga on a deeper level and understand the science behind this practice, she completed Restorative Yoga 1 and 2 Teacher Training with Ann. In addition, and has a 200-hour certification in Bhakti Yoga from Gopi Kinnicutt. Join her in experiencing the nourishing and healing benefits of restorative yoga which include: calming the nervous system, deep relaxation, being in poses without effort and an opportunity to quietly connect with the mind and body from a neutral, nonjudgmental place. She offers private 1:1 Restorative Yoga sessions as well as private small group sessions.